If you own an iPhone, chances are high that you’ve run into problems related to video processing during your time using the device. The 4K videos captured by the handset may be too big in size, or even unplayable on other devices. At such times, you feel the need for a tool that will help you quickly standardize these large clips for them to play flawlessly on all your devices. VideoProc is one such video processing program available for Windows and Mac both. Its rich and varied list of features is the reason why VideoProc is not just called a video converter. 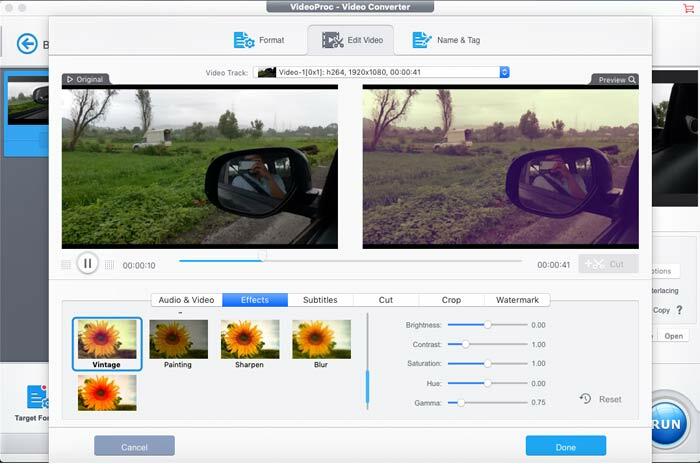 It lets you edit videos, resize them, encode or decode them, add watermarks or subtitles and much more. But that’s not what differentiates it from most other such tools in the market. 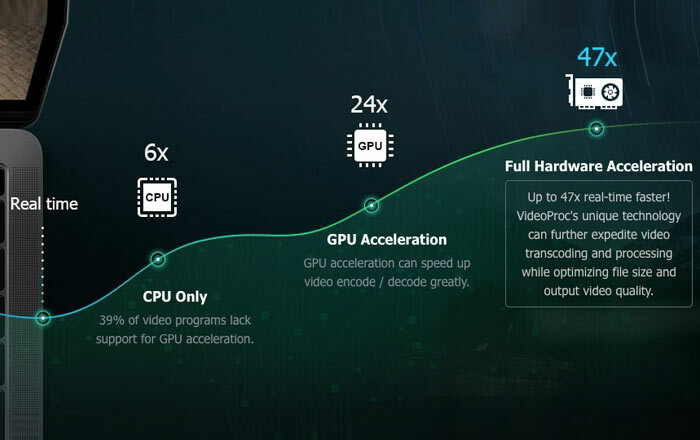 Its claim to fame is its level-3 acceleration, which harnesses the power provided by your GPUs to deliver up to 47x faster processing speed. This also ensures that your CPU alone is not doing all the heavy lifting. The versatility of VideoProc is on full display when you first open the application. It presents you with a layout containing four different sections. While one is for video processing, the other three are meant for converting DVDs, downloading online videos and recording your screen activity, respectively. But we’ll be focusing only on the video processing part in this review. The learning curve of this software won’t be a steep one if you’ve ever used a video converter before. Once you’re in it, you can either drag-and-drop the files you need processed or manually choose them using a file browser. 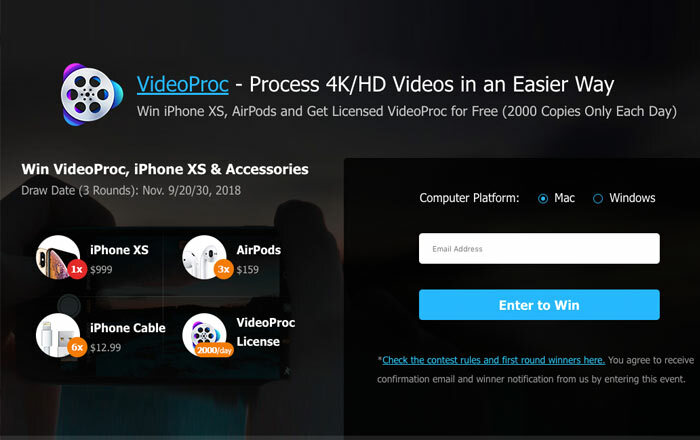 So keep those 4K videos from your iPhones and GoPros at the ready on your Windows or Mac machines before you fire up VideoProc. With the required file loaded, the program will render a blue bubble with all its details. At the bottom of this bubble are options like Cut, Crop, Subtitle, Effect and more. You can choose Cut if you wish to remove unwanted parts from your main video. This really helps save the space that the full file would have consumed on your iPhone. Crop is of course meant for removing unwanted parts from the frame. Both these processes are incredibly easy to perform thanks to the intuitive user interface of VideoProc. Same goes for functions like adding subtitles, effects and watermarks to your videos. That said, let us go back to explaining the video processing aspect of the application. When you’re done with the snipping or resizing of your video, the bar at the bottom of the interface is where you should go next. It shows you a number of popular formats that you can have your clip processed into. These include H.264, HEVC and more, with presets for resolutions meant for playing the videos on various devices. You can even set these parameters manually by clicking on the wrench icon beside every imported video. In the preset section, there are more than 420 output formats to choose from. Besides these categories is another one of VideoProc’s main attractions – its Toolbox section. This is where the option to stabilize shaky footage can be found. All those unwanted shakes are magically removed from your clips once the processing is complete. However, do keep in mind that this happens at the expense of resolution. The Toolbox also has an option named DeNoise, which helps remove grain from videos shot in dark conditions. And moreover, this section even hides a GIF maker among other things. Once all your selections are made, do make sure that the Hardware Acceleration Engine option is chosen in order to speed up the process. The big blue Run button can now be pressed to get your final video rendered. The best part of this program is that it doesn’t tame you with its complexity. You can choose to take the easy route by using its presets or really dig deep into the settings to get your desired output. And you can switch between these two choices easily. This is not the only useful product that Digiarty has on offer. Its DearMob iPhone Manager is a great tool that helps you backup iPhone to computer. As for VideoProc, you can try it out for free, but a one-year license will cost you $29.95. A lifetime license will set you back by $42.95. These prices apply to both the Windows and Mac versions of the software. Its makers are also running sweepstakes in which you stand a chance to win free licenses as well as an iPhone XS, Apple AirPods and more. So the next time you have to resize an iPhone video or convert HEVC to H.264, do give VideoProc a try.